What do you think? Shall I use it in my next Gunpla review? DIY My3D viewer review. Yes make your own! So I am still waiting for my actual proper Hasbro My3D viewer case to arrive, sent from America via a YouTube buddy who I've previously traded with. He PM'd me the necessary code to unlock the software. There are 7 apps available right now downloaded via the App Store for free! 2 are actually fair stabs at being proper games and will cost money at the end of May 2011 so download them now whilst they are still freebies. But you have to ask, how does he view the 3D content whilst his Hasbro viewer is still in transit? Well...I can verify for you that naked eyeball viewing via cross eyed method works, but the Gyro games mean moving the iPhone around, immediately knocks you out of that perfectly aligned zone-of-3D-working. However, "if" you have common items around the house such as a HB pencil, some sticky tape... and crucially a Holga 3DCV folding portable slide viewer (as you no doubt do) hey presto! a makeshift My3D viewer... of sorts. The pencil helps raise up the iPhone for better alignment with the lenses. Liberal application of sticky take helps make the thing stable. Peeking through the eye holes, I can report that it works! You can even control the UI with your fingers via the open sides fairly effortlessly. The screen is in focus, but as the images are closer set together than the eye holes. I think I am going a bit cross eyed to work it's magic. The actual official My3D viewer, I expect, has the iPhone screen placed further away from the lenses and maybe has lenses that converge to overcome the closeness of the images. In case you were wondering, the magnified retina screen looks good even zoomed up! The pixel mesh is visible, sure, like looking at an LCD computer monitor from about 30cm, but hardly detracts from the fun. Can't imagine the lower resolution non-retina screens to do quite so well in this department. The 3D effect is impressively... 3D! In-game instrument panels are displayed with a sense of floating up in front of the backdrop in the space shooty game. The Sharky game where you swim about looking for fish to eat, gives a sense of oceanic depth if not width. All content is in a portrait aspected image. The Gyro control is a lot of fun too. Though having had my fill of fish for one evening, I must say I have a bit of an aching neck. The elements all add up to make a rather novel experience that you should try for yourself (minus the neck ache perhaps). I can only expect the games to get better and gawd I hope some proper developers take this SDK of Hasbro's My3D and run with it. Can't wait to try this again once my REAL viewer arrives. My mini Holga 135 3D has arrived! Here's how the diminutive 135 stacks up against her 120 big sister. 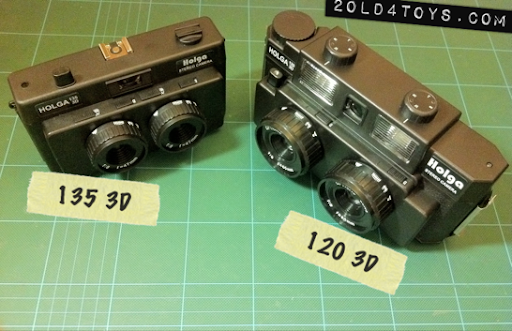 At around 70USD, the new Hoga 135 3D costs a bit less than it's big sister the Holga 120 3D. Running on 35mm will lower the ongoing costs for buying film and developing images. The smaller size no doubt makes her more convenient to carry around so will more likely be by your side, but most importantly to me, is if the 3D output is up to snuff? Will the reduced ocular separation and 135 film size hinder the 3D experience? There's a dinky mini 135 slide viewer for this camera too! It's SO cute... I want her NOW! Recently bought a Holga HPL-C Pinhole Lens for Canon DSLR/SLRs. I'm sure they do a HPL-N too if you have a Nikon. Can easily find them on ebay for about 15USD before shipping. A pretty recent product far as I know, direct from the Holga factory themselves. Made in China. The lens body is cleanly molded in black plastic. No rough edges or anything. Lovely clean white lettering. Looks very smart. The hole itself is 0.25mm, again, using black plastic and mounts like any other lens on your DSLR body. The lure of infinite depth of field and all that... that's why I bought it, and it wasn't very costly. Never dabled in Pinhole photography before and not that knowledgeable on normal non-pinhole photography either to be honest, but I'm learning. By its nature of being teeny weeny aperture, you need long exposures to get a picture. An evening, indoor shot exposed for 19 sec produces image that reveal horrendous crap on my sensor I never knew I had (unless I'm mistaken). Like giant freaking alien ameobas floating around all over the place! OK so I have a tiny APS sensor, 400D that has never been cleaned in its 4 years of life and that probably does not help... but to the naked eye, the sensor looks pristine. Of course this is just the "naked eye" but like I say... What do I know about photography? Very little. So anyone with experience tell me this is normal to have pinhole photography show up tones of crap on your sensor you normally would never see taking pics through a real glass lens? I'll post up images shortly. It's fair to say this lens is an inexpensive accessory, but pretty bummed it made what I thought was my otherwise sound DSLR look filthy! Maybe the ameoba-fest is a look you are after? Not me though... I'm taking my camera to get it cleaned properly by Canon themselves and will see if it makes any difference. Check back with me later for updates.